My good friend, talented writer and co-author Greg Fish, sent me this cartoon last night and I got a giggle out of it, so I thought I’d share. I think it exemplifies just how something so small can be blown completely out of proportion. Although the cartoon depicts two Mayans constructing the “Sun Stone”, it was actually the Aztecs, another mesoamerican culture, who constructed the Sun Stone. But that’s not the point of this article (besides, several doomsayers are clueless about the difference between Mayans and Aztecs anyway). So, the Mayans created a number system that lasted 5126 years. Judging by their love of cycling calendars that reset after 260 days (Tzolk’in calendar), 365 days (Haab’) and 52 years (Calendar Round), isn’t it logical to assume the Long Count calendar was designed to do the same thing? 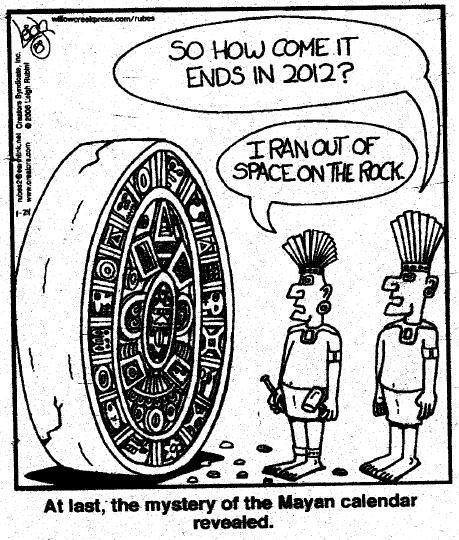 And why didn’t the Mayans explicitly say: “the Long Count will cycle again after 5126 years“? That’s because they were still in their first cycle. And within this first cycle, their entire civilization rose and and crashed back down again. They never got the chance to experience one whole cycle, resetting the Long Count or, indeed, simply extending it. In short, the world isn’t going to end in 2012 (the coincidental end-date of the Mayan Long Count calendar), it’s the last stand of an ancient culture. It’s actually rather sad; assuming the historians are correct, and the Long Count does end on December 21st, 2012, that is the final end date for an entire civilization. Although their cities may have crumbled and civilization faded into the history books, at least the Mayans had a calendar that endured hundreds of years after their downfall. 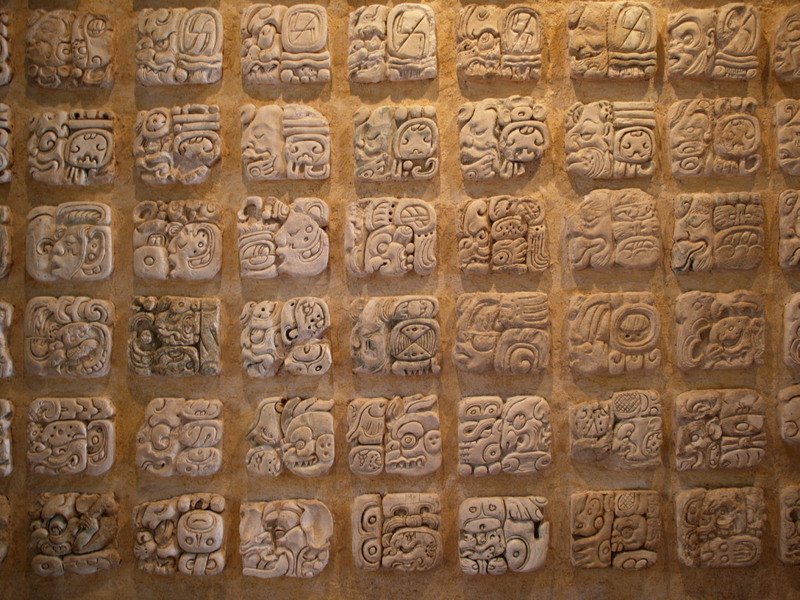 The Mayan Long Count calendar outlived a civilization, perhaps December 21st, 2012, should be a celebration of a lost mesoamerican race, as this date will truly be the end of ancient Maya. About the cartoon, that’s actually an Aztec calendar. Not Mayan. About that comment, read the article, paragraph one. Hi Ian;According to my own (web based) research, the long-count calendar has so many unanswered questions that it is impossible to sort out exactly when it 'ends'… if it ends at all. In fact, on my “Mayan Prediction” page http://2012hoax.wikidot.com/mayan-prediction (doing my own pimping here) I quote some sources which point out that the longest unit used in the long-count calendar, the alawtun, is about 63 million years. The idea that the long-count 'ends' on the 2012 solstice is almost entirely the work of devotees of 'Mayanism' like Arguelles and Jenkins, and has no basis in the scientific literature. About the cartoon, the Maya calendar is a system of distinct calendars and almanacs used by the Maya civilization of pre-Columbian Mesoamerica, and by some modern Maya – see freelance writing jobs for more details. FOr the record,,, I came up with that joke a long time ago.. =/=. The very first Crane Stand was crafted of powder-coated steel with the help of aeronautical engineer and designer Brandon Wilke. The mobile laptop stand was first released at Decibel Festival (An International Electronic Music Festival) in 2008 in Seattle and received an overwhelmingly positive response from the music community. Soon thereafter, hands were shook securing a deal with a large-scale distributor, and it wasn’t long until the Crane Stand was in full scale production. We do not know the truth, and those who know the truth will not tell us. Crane Stand is simply the highest quality Adjustable Laptop Stand on the market and the only DJ Laptop Stand that is made in the USA. The robust Portable Notebook Stand was rated #1 in stability, and is the only Foldable Laptop Stand with a 3-leg design. The Crane stand was designed with the highest quality standards in mind. The people behind the Crane Stand are DJs and musicians ourselves, and a few years back after surveying the marketplace we weren’t happy with the adjustable laptop stands available so we decided to build our own. Next Next post: Chances of the World Being Destroyed by the LHC is 50:50. Yes, Walter Wagner Is Back!